It's time for another Wedding Workspaces, and this month, we're sharing our fourth installment with another fab local wedding pro! 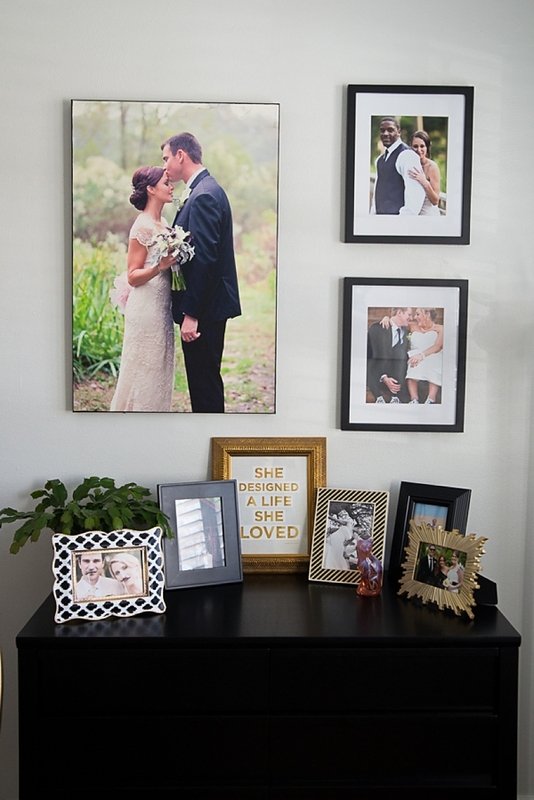 And today, we have wedding coordinator and vendor fam Jill Brown of Sunkissed Events and Design and her funky chic home office space in Virginia Beach. 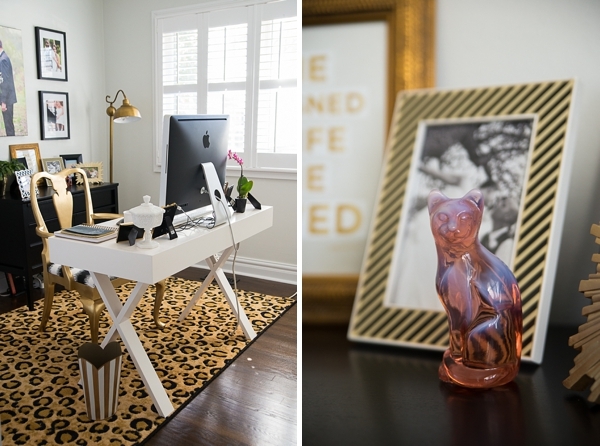 Through leopard print and touches of gold, black and white, this cat-loving designer has made her work space not only fabulous, but practical. 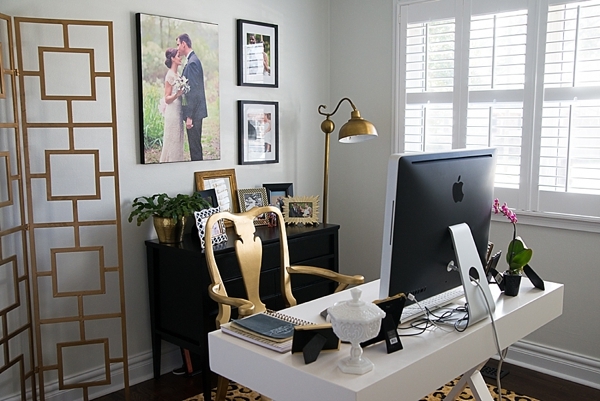 The inspiration for my office is really all things that I love like leopard print, gold, and black and white. I wanted a clean look but still funky with my own twist on things. Since it's a home office, I actually don't conduct initial consultations here, but I do often have meetings in my office once my clients and I start working together. It's no secret that I'm a cat mom, so it's always good to first find out whether my clients mind my little furry supervisors. The photo of my Mother and me when I was little. First, it's my favorite photo of us, and second, she once told me to find something I love and do it-- she's my inspiration. 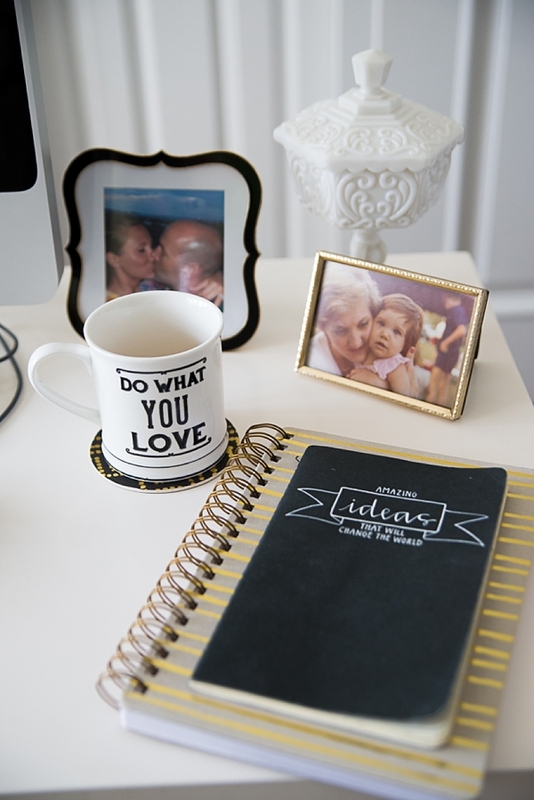 (It's why I have that "Do what you love" mug!) She has always supported me through every avenue in my life. I am sort of a picker and finder. I always find things at the craziest places and end up turning them into something. I found my chair at a thrift shop in Norfolk and refurbished it. The white milk glass dish I found at an antique store in Norfolk, and the Fenton cat (CAT MOM!) from Barrett's Antiques in Virginia Beach. Of course, TJ Maxx is the mecca for picture frames. I always thought I wanted to incorporate the color coral. I don't know why but the more I really started designing my space, the more I realized I loved the simplicity of the three colors of gold, black, and white. I am really attracted to patterns and textures, so I knew I wanted the blend of those. Sometimes it just takes time to find the right pieces and finesse it all together. I've been working on the office since we moved in about two years ago. The wedding photos really brought it all together for me as my design focal point. The "Amazing Ideas That Will Change the World" notebook on my desk was given to me by a dear friend who has supported my business, and it's something that I will always cherish. You can get to know Jill and her wedding happenings on Facebook and fun everyday, kitty-filled life captures on Instagram.